Lush green valleys and Irish hospitality await! Set sail aboard the Celebrity Reflection for a 14-night Transatlantic ocean crossing from Ft. Lauderdale, with stops to the Azores, Cork, and Liverpool before arriving in Dublin. You’ll spend seven relaxing days at sea enjoying Celebrity Cruises’ hospitality and then experience the untouched beauty of the Azores and visit both Cork and Liverpool before ending your cruise in Dublin. Get ready for a one-of-a-kind experience in Cork when you set off on our exclusive full-day guided excursion with your Irish tour director, complete with a live band playing traditional Irish music and lunch in a traditional Irish pub. 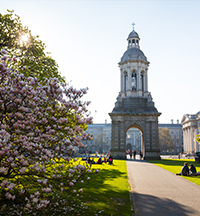 Upon debarkation, your journey continues with the warmth of an Irish Welcome as you spend five nights in Dublin “at home with the Irish.” You’ll meet real locals as you personally discover what makes the Irish so vibrant and beloved. Meet the owner of a pub established in 1595, and hear his story about the pub. Travel to the countryside and discover an ancient monastery, and learn about the history of Guinness as you pour yourself a pint. Meet an Irish farmer and his wife, and have lunch while you learn about their daily life. Stop at a rural pub to meet the owner, and spend time exploring Dublin and Belfast.